As thousands of families in northern Syria flee from their homes, many across the border into Turkey, army tanks widened the military campaign to crush protests against President Bashar al-Assad, according to Reuters. More than 8,500 Syrians have now fled to refugee camps in Turkey. Fleeing refugees are reporting that the army is shooting at anything that moves, and that the troops are burning land and crops in a scorched earth policy to subdue people of the region after large protests against iron-fisted rule. Assad is a member of Alawi religious sect followed by 10% of Syria's population. Alawism is a belief system that has merged Christianity with many Muslim beliefs, as well as traditional pre-Islamic beliefs. 70% of the army is made up of 200,000-300,000 Sunni Muslim conscripts, and there have been some reports that Sunni conscripts are defecting because they don't want to fire on peaceful, unarmed Syrian protesters. But according to commentary that I heard on al-Jazeera on Tuesday, it would be a mistake to assume that a major mutiny is near. Although most of the army is Sunni, the Alawi divisions have the best training and hardware, and they will remain loyal to Assad. There is a lot of pressure for the Sunnis to abandon the regime and join the protesters, but this does not present much of a challenge to the regime unless a rebel army can be fashioned out of these defections, as happened in Libya. A successful challenge would require a critical mass of defectors, and a territory under rebel control, like Benghazi in Libya. The Assad regime is moving quickly to shore up loyalty among its upper ranks, and to keep control of the entire country. As long as even a portion of the army remains loyal, as has happened in Libya, the Assad regime will stay in place. On Sunday, Russia's Ministry of Foreign Affairs issued a somewhat confused statement regarding the deployment of the USS Monterey in the Black Sea. "The entry of the US Navy’s Aegis BMD-equipped Monterey cruiser into the Black Sea to participate in the Ukrainian-US Sea Breeze 2011 exercises has raised several questions for us. The Monterey was sent to European waters as part of the US administration’s Phased Adaptive Approach to building the European segment of its global missile defense system. Phase 1 provides for the deployment in the Adriatic, Aegean and Mediterranean Seas of a group of American ships meant to protect Southern Europe from hypothetical missile threats. According to the official US version, they can also be forward deployed to the Black Sea in case of need, such as aggravation of the situation in the region. While leaving aside the unresolved question about the architecture of a possible European missile defense system as per the Russia-NATO Lisbon summit decisions, we would like to understand just what the US command meant by “aggravation” as it moved the main striking unit of the emerging territorial missile defense system of the North Atlantic Alliance from the Mediterranean to the east. If we are talking about the usual “visit” to this highly sensitive region, why did they choose a ship armed with this particular version of weapons? And what role was assigned to the Monterey anti-missiles by the scenario of the Sea Breeze 2011 exercise during which “an anti-piracy operation by NATO standards” was being tested and improved?" There have been several commentaries on this Russian "overreaction" to the participation of the Monterez in the annual joint U.S.-Ukraine military exercises, this year named Sea Breeze 2011. And all of the commentaries indicate that this is less about a missile system, and more about Syria. 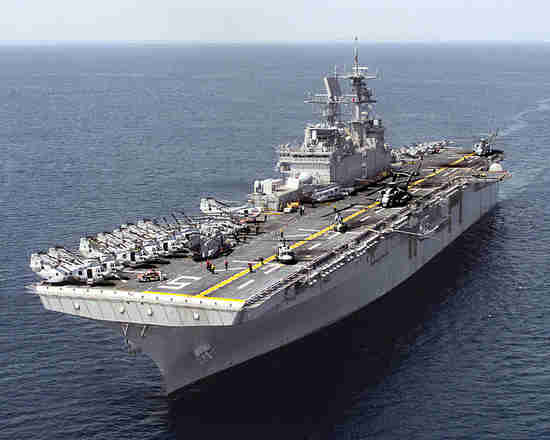 According to an analysis by senior Indian diplomat M K Bhadrakumar in the Asia Times, the purpose of deploying the Monterey in the Black Sea is to pressure Russia to back down from its defense of Assad in Syria. Russia has made it clear that it will oppose any U.N. Security Council resolution on Syria, no matter how weak. Russia has a Mediterranean naval base in Syria, and doesn't want to put that at risk, as would happen with a regime change. "By improving ties with Turkey in the past decade, Moscow had been hoping that Ankara would gradually move toward an independent foreign policy. The Kremlin's expectation was that the two countries could get together and form a condominium over the Black Sea. But as events unfold, it is becoming clear that Ankara is reverting to its earlier priorities as a NATO country and US's pre-eminent partner in the region. Ankara cannot be faulted: it made a shrewd assessment and drew a balance sheet concluding that its interests are best served by identifying with the Western move to effect a regime change in Syria. Additionally, Ankara finds it profitable that it identifies with the Saudi approach to the upheaval in the Middle East. The wealth Arabs in the oil-rich countries of the Persian Gulf are willing to send their "green money" to Turkey. Ankara also shares Saudi misgivings about Iran's rise as regional power." This is resulting in enormous pressure on Russia to turn against Assad, but either way, these events are giving the U.S. the upper hand over Russia in the region. According to an analysis by Debka, an analyst group that has contacts within Israeli and American intelligence but sometimes gets things wrong, the deployment of the Monterey in the Black Sea is just one part of a major realignment of American forces in the region. The purpose of this redeployment is to be prepared in case a decision is made at some point in the future for U.S. military intervention in Syria. This huge concentration of naval missile interceptor units looks like preparations by Washington for the contingency of Iran, Syria and Hizballah letting loose with surface missiles against US and Israeli targets in the event of US military intervention to stop the anti-opposition slaughter underway in Syria." According to the analysis, the threat of US military intervention in Syria is being taken seriously by Iran and by Hizbollah, Assad's two major allies in the region. Furthermore, although Turkey's Prime Minister Tayyep Erdogan does not wish to be seen working closely with the U.S. military, it's believed that Washington is coordinating its military movements with Turkey, and that Erdogan quietly agreed to place Turkish bases at US disposal for an operation in Syria. Soooooooooooooo, where is all this going? Barack Obama promised us that if he were elected President, then he would make sure that we would no longer be fighting in two foreign wars. As we appear to be approaching war number 4, it looks like that campaign promise is being kept.